If every stroke is analysed, there would be a huge amount of information to analyse, which could be ambiguous and difficult to comprehend. To solve this problem as well as accurately represent the data, a method is used in which raw data is converted into a form where one typical stroke cycle for the sample is shown - consequently this is called an “averaging” process. The stroke cycle start time was defined as the moment when the oar (right oar in sculling) of the stroke rower crosses the zero angle (the perpendicular to the boat) during the recovery phase. This moment is used as a trigger of the stroke cycle for the whole crew. The average cycle time was calculated over all the strokes in the sample and then each cycle in the sample is normalised to the same average cycle time. 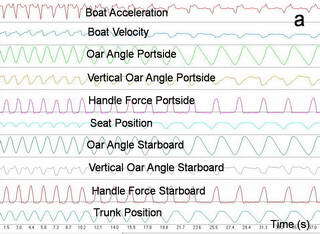 The data is then processed (averaged) into 50-point data arrays for each measured variable (oar angle, force, etc.). Discrete data values (extremes, sub-phases) are then derived using second-order polynomial interpolation based on the four nearest points of the arrays. The normalization algorithm was checked for validity by means of a comparison between the derived values (such as catch and release angles, maximum force, work and power, etc.) calculated using normalized data, and an average of those values from each cycle in the sample using raw data. The differences ranged from 0.02% to 0.85%, which were considered satisfactory. The specific feature of the technique in b is a significant change in the timing of the maximal force application: at lower rates the rower applies more force in the second half of the drive (1), but at higher stroke rates the peak force is shifted to the first half of the drive (2). The comparison of the start and finish sections (3) gives us information about fatigue resistance, which was satisfactory in this case. 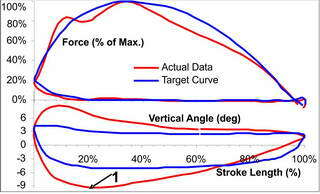 Figure c shows another example of changes to the force curve at various stroke rates: the force gradient (the rate at which the force increases) at the beginning of the drive (1) remains the same at all stroke rates, as well as the position of the peak force (2). However, at stroke rates higher than 30 this sculler suffers from a ‘hump’ in the force curve (3), which is caused by the early activation of the trunk at the catch, then a decrease in its velocity when the leg drive is the fastest. The hump occurs at the moment of the second activation of the trunk (see Blade Entry) and is also related to weak posture in the sculler and a very deep burying of the blade (see Vertical Oar Angle). Such “disconnection” and double emphasis of force application significantly decreases rowing effectiveness at racing stroke rates and negatively affects performance. This evaluation method allows clear and effective feedback for rowers and coaches, and helps improvement of technique.